The monument is in honor of those from Ashe County who died in World War One, World War Two and other wars prior to World Wars. The monument has a two tiered base with an obelisk on top. The base and obelisk are constructed of rusticated stone blocks. The top of each base section consists of beveled poured concrete several inches thick. The entire structure rests on a concrete base. The base sections are 48 inches and 36 inches square. The total height is between 16 ft. and 20 ft. tall. A small light is affixed to the point of the obelisk. There are three bronze plaques attached to the base section below the obelisk. Two of the plaques list dead from World War One and World War Two. The third and smaller plaque honors all who had died in previous wars. Each plaque carries an American Legion seal above the inscriptions. [Bottom center] COLORED / HARDIN, SAMUEL C.
The monument is located in front of the historic Ashe County Courthouse at 301 E. Main St., Jefferson NC. It stands to the right when facing the main entrance to the building. The historic courthouse serves now as the Museum of Ashe County History. 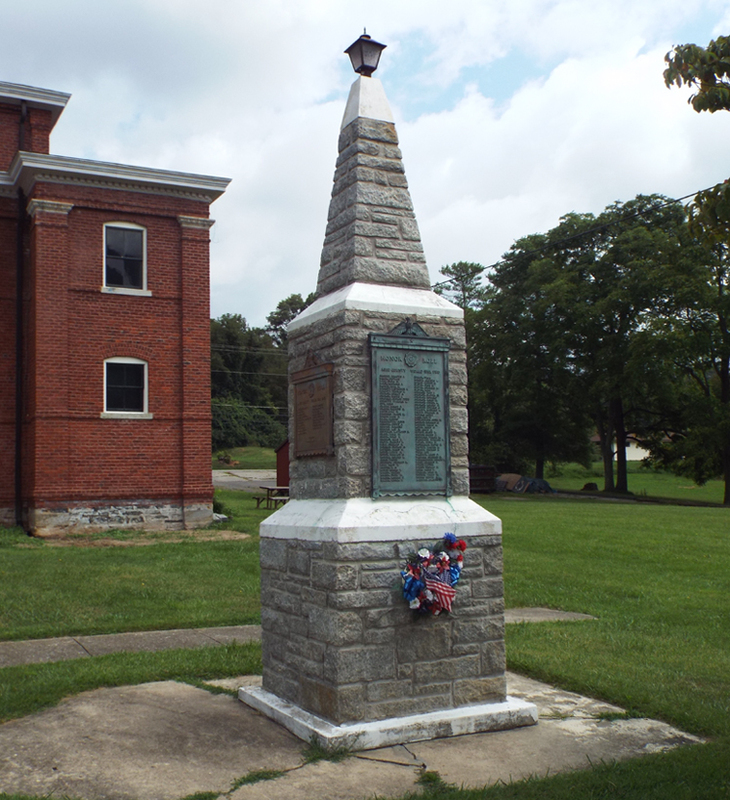 The Ashe County Veterans Memorial is located in front of the new Ashe County Courthouse, on the other side of Highway 221, at 150 Government Circle. 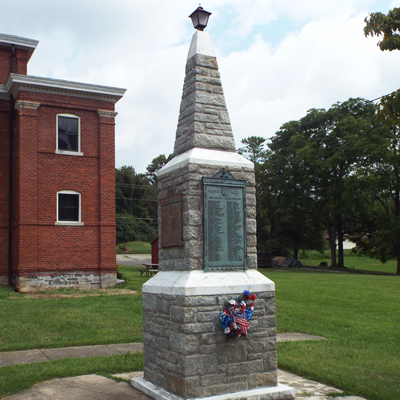 The monument stands on the front lawn, with several mature trees on both sides of the the Museum of Ashe County History.